The Ateneo de Manila University Ricardo Leong Center for Chinese Studies and the Ateneo-Celadon present the 6th Spring Film Festival featuring the cultural heritage of Mandarin language movies on January 20-29, 2012 at the Shangri-La Cineplex at Shaw Boulevard in Mandaluyong City. This is in celebration of the Dragon Year of the Chinese calendar. 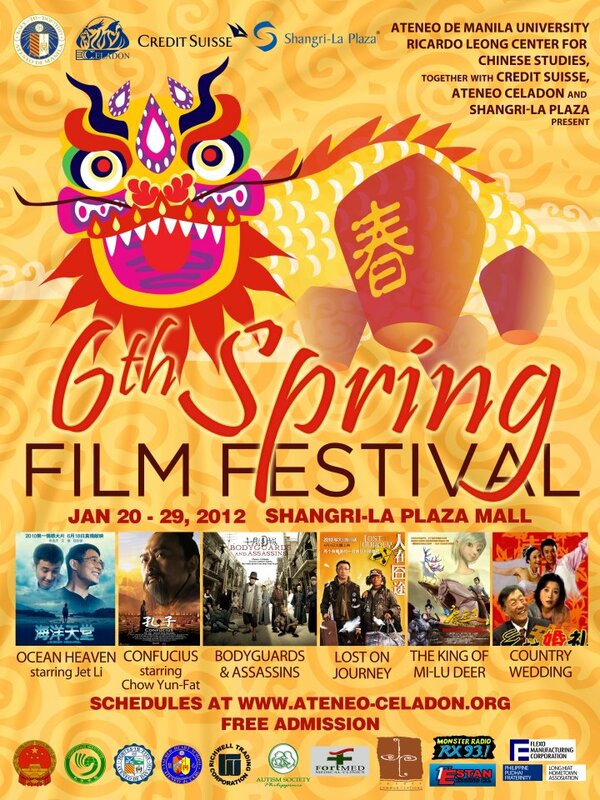 The festival will screen six (6) films: Ocean Heaven, Confucius, Bodyguards and Assassins, Lost on Journey, Country Wedding and King of Mi-lu Deer. Admission to all screenings are FREE but on a first-come first-served basis. Please see complete synopses and screening schedules below. It has been said that the hardest job is to be a parent. Parenting becomes even more challenging if you’re raising a special child. Ocean Heaven features a father- Sam Wang, who solely took care of his autistic child. Faced with illness, Wang searched for institutions that would accept his son. But no institution was apt for his son’s condition. Thus, Wang needed to train his son by himself and patiently taught him how to be independent for his own survival. As the days went by, Wang and his son got closer to each other which their friends had witnessed. This heart-warming film shows how parents, even on their last days, would do anything just to ensure the safety and happiness of their children. Note: This movie is also the first to cast Jet Li in a non-kung-fu film where he won the 2010 Wen Zhang Best Actor Award; The movie was also recognized by the Shanghai Media Awards, CCTV Movie Channel Media Awards 2010 and Golden Goblet Award. He is the Chinese Philosopher who has been regarded as the “The Great Sage.” Confucius lived during the time when China’s dynasties were in chaos and engulfed by corruption and greed. He strongly believed that ethics and education will put all things to order. His wisdom was sought by different dynasty leaders but only to be abandoned after he dutifully served his purpose. The world knows so much of his teachings, but little is known of his hardships. This biographical drama shows the sufferings and pain Confucius endured and the principles he fervently kept that became the foundation of China’s ethics, morality and law. 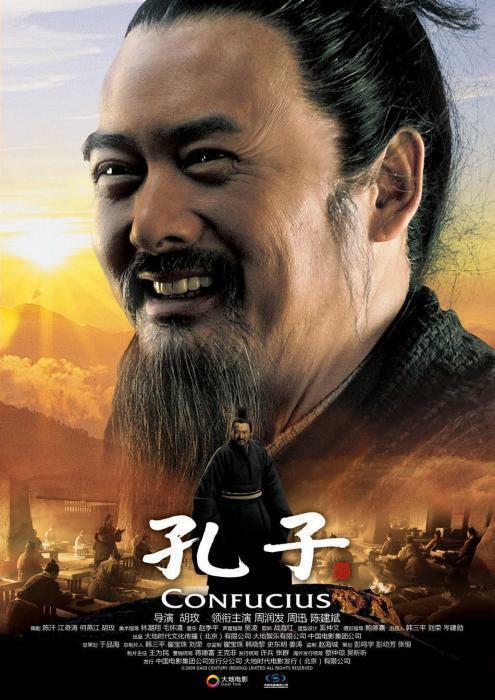 Note: Stars Chow Yun-Fat as Confucius, Nominated for Best Actor at the 30th Hong Kong Film Awards. Other nominations include Best Cinematography, Art Design, Costume Design and Original Song. In 1905, Hongkong was under the British rule and revolution was on the rise. One man was set to land in Hong Kong to meet and to unify faction leaders to finally take down the corrupt and crumbling Qing Dynasty. Because of this, Dowager Cixi wanted this man assassinated. For the Chinese people who had been clamouring for freedom, they understood that keeping this man alive would mean keeping China’s hope to be liberated. Li Yutang, a businessman, gathered a tofu vendor, rickshaw pullers, a beggar and an orphan to serve as bodyguards. These bodyguards displayed their superb fighting skills as they battle it out with the assassins to protect this man they haven’t even met. Find out who this man was and why did these commoners sacrifice their personal dreams and lives for him. 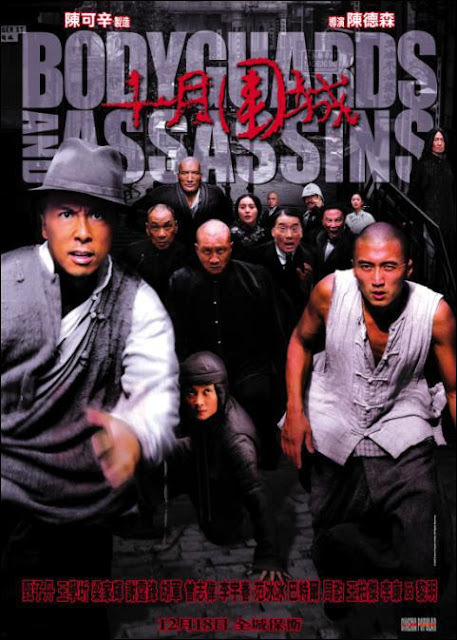 Note: This action-historical movie garnered numerous awards from the 4th Asian Film Awards, 29th Hongkong Film Awards, 16th Hongkong Film Critics Society Awards and 47th Golden Horse Awards. The Chinese New Year is the most important event for every Chinese Family. During this time, everyone goes back to his hometown to celebrate and to greet the New Year in the company of his family. This time also means that all modes of transportation is busy and fully booked. One passenger, Li Chenggong hopped from a plane, to a train, to a bus, and to a boat in the desire to be with his family. And along the way, he met a stranger Niu Geng who helped him discover something important about himself and the goodness of other people. 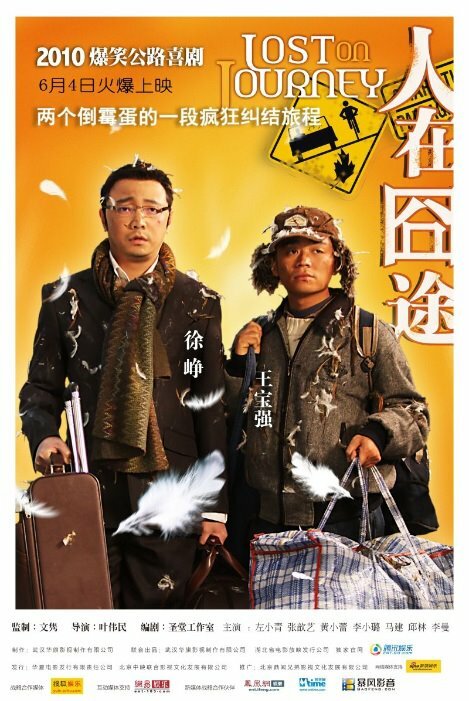 This movie is a funny presentation of how bad luck brought two different worlds together. Find out if Niu Geng and Li Chenggong made it home on the eve of the New Year. Yuanfeng and Mengyan are getting married. As soon as they’ve announced their wedding to their families, excitement filled their respective households. So much the excitement, that their parents started to meddle with the wedding plans. Mengyan’s mother, who is living in Beijing, insists of holding the wedding at the Tiandu Hotel. On the other hand, Yuanfeng’s father, being the director of the cooperative in Kangjiazhuang village, feels indebted to the community, therefore, he wants to share the wedding to the whole village. This film is a funny portrayal of the clash of cultures between the city and country side. Who will convince who? Where will Yuanfeng and Mengyan celebrate their wedding? 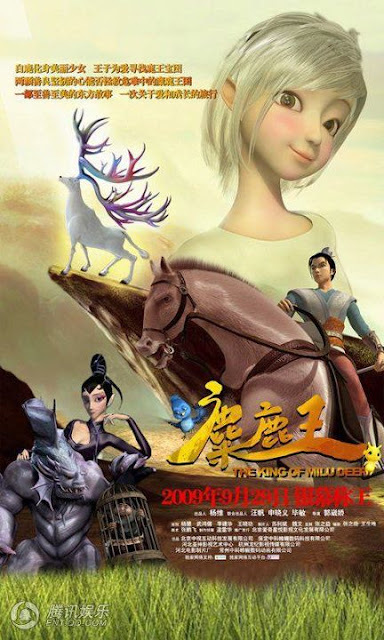 King of Milu Deer is the first 3D animation attempt of China aimed to promote environment protection. It is a story of a white deer,Yoyo, who turned into a lady and made friends with Tzan-the prince of Kingdom of Clouds and Dreams. Tzan was ordered by the minister to search the Labyrinth Mountain to hunt for the Milu Deer to use it as a sacrifice to bring rains in the kingdom. But Tzan discovered the beauty of the Labyrinth Mountain and got closer to Yoyo. Together, they fought sea lizard monsters, fire,soldiers, and the evil Minister to save the wildlife and natural resources of the Labyrinth Mountain. Note: This movie became the highest grossing Chinese Animated film of all time and received the Best Animated Film of the 13th Huabiao Awards.